Analyze human population distribution graphs to predict the impact on global resources, society, and the economy. Construct and maintain a model of an ecosystem. Build a prairie - interactive site where students construct a prarie. If you choose the right plants and animals, you can watch the prairie come to life before your eyes! Monitor and evaluate changes in a yeast population. Investigate an outdoor habitat to identify the abiotic and biotic factors, plant and animal populations, producers, consumers, and decomposers. Conduct research on how human influences have changed an ecosystem and communicate findings through written or oral presentations. Describe a sequence of events that illustrates biological succession. Predict how population changes of organisms at different trophic levels affect an ecosystem. Interpret the relationship between environmental factors and fluctuations in population size. 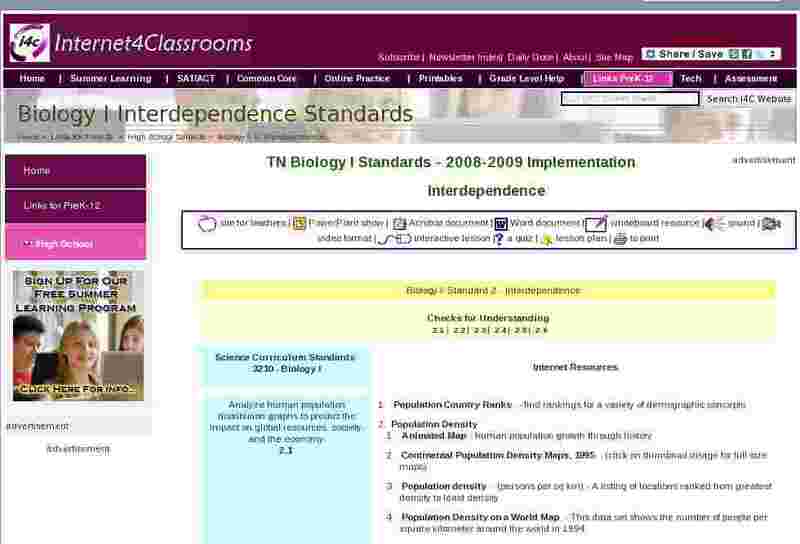 Determine how the carrying capacity of an ecosystem is affected by interactions among organisms. Predict how various types of human activities affect the environment. Make inferences about how a specific environmental change can affect the amount of biodiversity. Predict how a specific environmental change may lead to the extinction of a particular species. Coral Connections - a video which underscores the effects of uncontrolled development and personal behavior on the local society, the peninsula's water system, and the Mesoamerican reef. The film encourages viewers to spread the word and become a force for positive change. Analyze factors responsible for the changes associated with biological succession.